There are signs of climate change in nearly every aspect of our environment today, including the behaviour of the human civilisation. Melting ice caps in the last 50 years have had a ripple effect on the world. A few decades ago, the media began highlighting concerns about shrinking polar bear habitats as a result of drastic climate change. Yet, in 2007, the hypothetical sea route known as the Northwest Passage was so devoid of ice that it was opened for shipping for the first time in recorded history, allowing a Norwegian cargo ship to successfully navigate the route in 2013 on a voyage from Vancouver to a port in Finland. 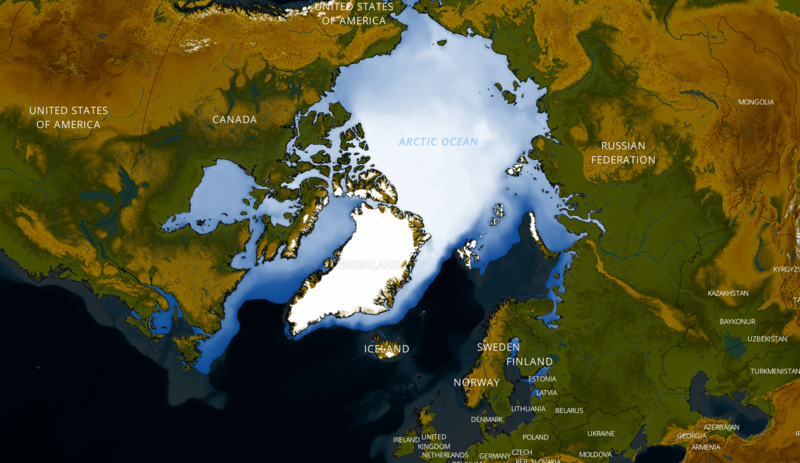 With foresight, the Russian government submitted a request to the United Nations in 2001 for permission to stake claim to a large swath of the Arctic. Even though the motion was rejected, Russia began moving submarines and aircraft through the region in a high profile manner. This activity sparked serious worries among other stakeholders in the Arctic, notably the Nordic countries, Denmark with its Greenland territory, and Canada. The Arctic is a rather difficult region to regulate, but is mostly covered by the UN Convention on Law of the Sea 1982 (UNCLOS) and the Arctic Council. Comprised of representatives from eight member states, the Arctic Council primarily addresses environmental concerns and the socioeconomic well-being of local communities in the region. It is made up of The United States, Canada, Russia, Sweden, Norway, Finland, Denmark, and Iceland. In order to be compliant with the UNCLOS 1982, the territorial boundaries of Arctic Council nations must end 12 miles offshore, whilst their economic zones can extend up to 200 miles. The agreement also gives freedom of navigation through the region to all, an issue which is becoming increasingly relevant as melting ice actually opens up new trade routes for ships to sail through. 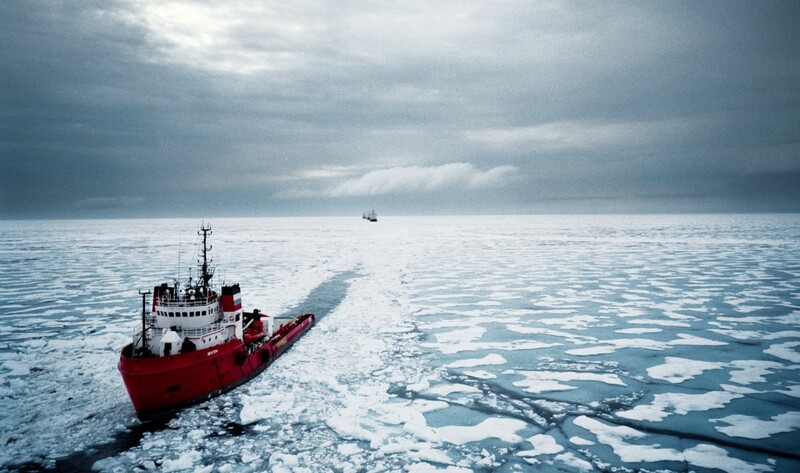 Commercial traffic through the Arctic has been growing significantly in the past decade, which creates the need for additional government presence in the region in order to provide security and safety. It is predicted to quadruple over the next twenty years as raw materials are shipped out in volume, construction materials are shipped in to support development, and melting ice leads to faster transit times. The Arctic region is rich in natural resources, a trait that drives competition between nations in the same manner that has been seen throughout all of history. While Canada expects a growing output of minerals from its Arctic territories, much of the Arctic’s potential resources — including one third of the planet’s untapped oil and gas reserves — are not clearly owned by any member of the Arctic Council. The council itself is intended to act as a barrier against any government establishing hegemony over the region, but increased Russian military presence, combined with Russian aggression in neighboring Ukraine and Georgia in past years, has made other Arctic nations cast a more serious eye on their northern coasts. Whereas Iceland was seeking to establish better economic relations with Russia up until recently, it was discouraged by the war in Ukraine and Russia’s takeover of Crimea. This February, Russian bombers skirted along the Icelandic coast, further pushing Iceland into the grudging circle of Nordic nations against Russia. Finland, a country whose older generation still recalls Russian and Soviet incursions during the first half of the 20th Century, is now questioning its security in the wake of recent events. This includes Russian military targeting Finnish research vessels in international waters, as well as repeated violations of Finnish airspace. Likewise, Sweden is also growing wary of Russian activity, as seen by their efforts in pursuing a suspected Russian submarine that entered Swedish waters in the fall of 2014. 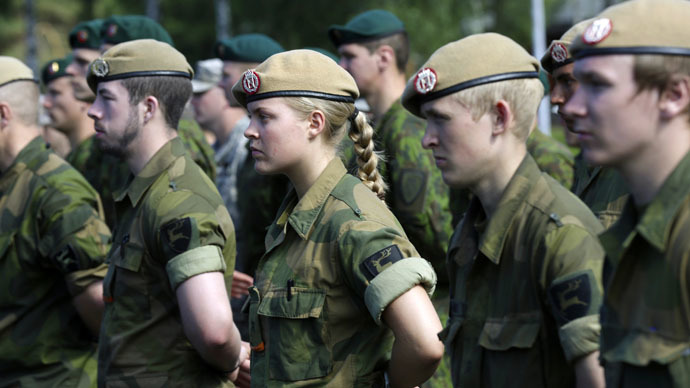 Unlike other Nordic countries, neither Finland nor Sweden are members of NATO, but both recognise a need for increased security cooperation with their neighbors. Norway made a show of strength its own response to Russia. Conducting an exercise called Joint Viking in the far northern Finnmark province, the Norway fielded more than 5,000 troops for the operation, making it the largest Norwegian military exercise since the Cold War. As a result, Russian navy was placed on high alert in the Arctic region, especially in areas bordering Norway and Finland. Ironically, Norway and Iceland had both been warming their relationships with Russia in recent years. For Norway, this involved dismissing the notion that Russia is a threat to global security as it had been in the past, as well as a decommissioned Norwegian submarine base being rented to the Russian government. On the other hand, Iceland had recently signed several agreements for economic and social cooperation, including the establishment of a joint center for collaborative development of geothermal energy. Now, it may be rolling back its willingness to work with Russia as it resumes a role similar to that of the Cold War years — when Iceland was the centre point of the Greenland-Iceland-UK gap (GIUK) that was patrolled to prevent Russian incursion into the North Atlantic. The physical changes occurring in the Arctic are heralding a parallel transformation of economic, political, and social relationships in the region. This grand shaft, deemed the “respatialisation” of the north, is making the Arctic region less of a periphery and instead more of a functional, critical part of geopolitics. Whilst governments, private industry, and local communities in the north may experience increased prosperity as a result of melting ice caps, they will also require environmental stewardship to mitigate the risk of accidents and damages. Russian commercial harbors along the country’s 10,000 mile coastline are being modernised, but investment in Russian military is also growing. Meanwhile, Canadian air patrols in the north have increased, and American military presence in Alaska continues to be marked by advanced missile testing ranges and regular deployment of paratroopers in frigid Arctic training grounds. Despite the economic promise of the Arctic, it truly appears to be a case of geopolitical tension for the time being. The state of affairs is not one where Arctic Council members are collaborating for positive developments in the Arctic, but rather one where Russia has indicated its intentions to seek singular benefit and compete sternly against other Arctic stakeholders. The gravity of the situation was further sealed last month by the emergence of a new Nordic defence agreement which calls for increased security cooperation against Russia in the far north. As in many other regions, it is now becoming clear that the key threat to peaceful economic cooperation in the Arctic is a solid alliance against Russian aggression. As the northern landscape continues to morph into something navigable and inhabitable, geopolitics may dive in the opposite direction and leave an increasing amount of anxiety and hostility amid the chilling Arctic waters. The tephra produced by the eruption interfered with flight traffic into late spring, but soon settled as the summer tourist season approached. 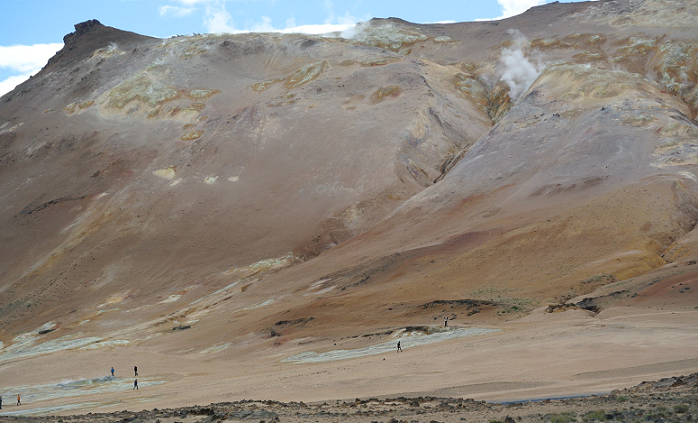 Volcanic activity is commonplace in Iceland, including frequent tectonic changes, occasional smaller eruptions, and a plethora of hot springs and geysers. The tephra produced by past eruptions is usually swept northward by winds, but 2010 proved to be an exception. In centuries past, other Icelandic eruptions have certainly had worldwide effects, particularly in the late 1700s when the atmospheric effects of the eruption of Laki resulted in what the famous Benjamin Franklin, in contemporary writings, described as “the year without a summer”. Since the 2010 eruption, however, Iceland has seen consistent tourism and expansion of nonstop flights from both Europe and North America. While tourist campaigns particularly emphasize the alluring beauty of Iceland’s volcanoes, the tumultuous landscape offers its patrons much more than just a claim to fame. Iceland is situated in a very unique location with regards to geothermal activity. It happens to be a volcanic hotspot which also sits atop the active tectonic rift of the Mid-Atlantic Ridge. The result of this is what we see today; a terrain where volcanic eruptions occur twice or more every decade and where minor volcanic activity is a daily occurrence. Geothermal energy has proven to be an especially abundant resource as a result of these characteristics, giving Iceland a unique advantage compared to other regions of the world as far as renewable energy generation is concerned. Whilst many countries have a strong focus on solar, wind, and hydroelectric power generation, Iceland is currently able to provide for over 60% of its energy needs using geothermal energy. 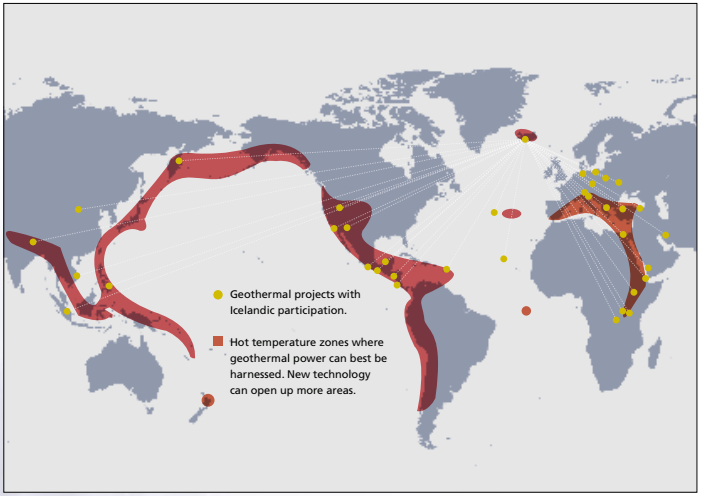 Other parts of the world have a similar potential for geothermal development, including the Hawaiian Islands and the area surrounding Mount Fuji in Japan. Yet, none have been able to harness the natural sources of heat and energy in the way that Iceland has. The European island nation currently has 6 geothermal power plants, and many smaller sites that help convert heat from the ground into usable electricity for the national grid. 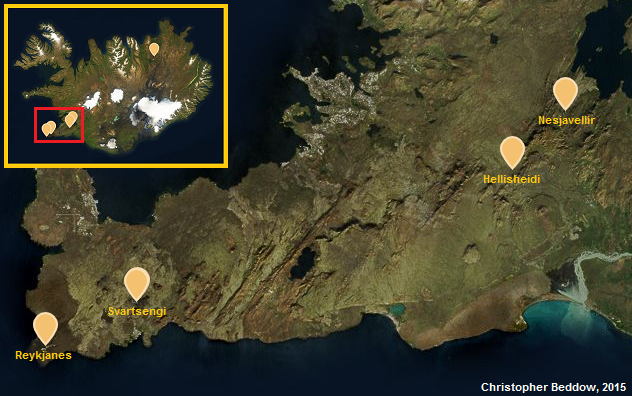 Of these plants, 5 are located on the Reykjanes Peninsula surrounding the capital city of Reyjavik, 2 of them at Svartsengi, and the other 3 near the towns of Reykjanes, Hellisheidi, and Nesjavellir. Most of Iceland’s population of over 300,000 resides in this area, with volcanic activity including some of Iceland’s most famous geysers in the Haukadalur Valley as well as the world renowned hot spring resort called the Blue Lagoon. Iceland’s geothermal energy is tapped by drilling beneath the surface. Often, this does not have to be very deep, as ground temperature rises rapidly near areas with tectonic activity. Groundwater running through these hot earth zones turns to steam, which can sometimes be seen emanating from geysers and hot springs. Many of these geothermal reservoirs have no actual other way of flowing out into open air. Apart from drilling, another method is to provide water externally and let it be heated by geothermal sources in order to produce steam. In both cases, steam is used to power turbines, thus generating an output of energy. Geothermal power plants produce a byproduct called brine, a type of contaminated water which must be carefully cooled down and separated in order to prevent it from mixing with freshwater ecosystems. In many places around the world, brine is not handled with care and can present a serious threat to fish, plants, and other parts of the environment. Overall, geothermal plants have a very low rate of carbon emission, often near-zero, but responsible maintenance and handling of byproducts is an essential requirement for it to be considered a truly clean source of energy. 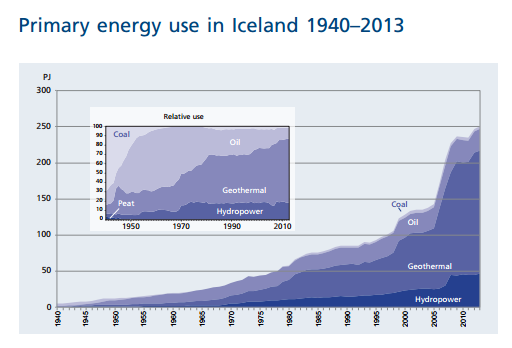 When it comes to percent of clean energy meeting society’s needs, Iceland is a world leader. While its circumstances certainly cannot be replicated at will in other countries, teams from Iceland have been actively working around the globe to help develop other geothermal energy projects insofar as geological conditions permit. There are active volcanic regions on every continent of the Earth, and although they have often been regarded as dangers in the past, many of them hold future potential as abundant energy reserves. North America, Europe, Asia, and Africa have all began developing geothermal energy systems, and in some cases Icelandic participation has contributed to their success substantially. Although geothermal energy can provide an essentially endless supply of power, there are also potential dangers associated with over-development. The geothermal process is in some ways similar to fracking, or hydraulic fracturing – which involves drilling into the earth and injecting fluids into shale rock layers in order to fracture the earth and release natural gas deposits. While fracking releases natural gases such as methane and other hydrocarbons, geothermal drilling only releases water vapor. Yet, in both cases, water is injected directly into the rock with the specific intention of causing fractures, which can cause small earthquakes to occur. However, these are often at a magnitude of around 1, which is unlikely to pose any real threat to infrastructure. Future geothermal projects in Iceland include the Iceland Deep Drilling Project (IDDP), which plans to test the practice of boring over 5 kilometers into the earth in order to extract heat from some of Iceland’s largest geothermal reservoirs. This depth, double that of conventional plants, is ambitious, but perhaps also dangerous. A feasibility report by the IDDP acknowledged the possibility of damage to geological features and formations, to wetlands and sensitive areas, and to local flora and fauna. However, these risks were deemed to be easily mitigated by undertaking the drilling far from roads. This would ensure that any damage is neither noticeable nor of any real social importance. The opposition to this project appears to be relatively silent, there has been very little activism on the issue, which suggests that there are no major concerns about the long-term risk of geothermal drilling to local communities. If all of this is correct, then the IDDP may represent a revolutionary step forward in renewable energy, allowing for much larger-scale extraction of geothermal resources that may further reduce the need for fossil fuels in grid distributed energy. Iceland, while not without its troubles, has recently become one of the world’s wealthiest, most stable, and most energy independent nations, despite being isolated and economically poor only a century ago. This very same isolation has contributed to the need for local energy development, in what is referred to as a spatially segregated system rather than one which is well-integrated with neighboring countries. Two minutes after midnight on October 12th, 1999, Adnan Nevic was born just outside Sarajevo, Bosnia. He was dubbed “Baby Six Billion”, as his birth marked not only the start of his own life but also the growth of human population beyond six billion worldwide. Population had been growing rapidly since the industrial age, and today stands at over 7 billion. More than 26 million people have been born in 2015 alone, a result of continuously increasing birthrates. While China and India are the hosts to the world’s largest population, the United States is a distant third. Meanwhile, Nigeria’s birthrate is rising so quickly that it is expected to exceed the US, Brazil, and Indonesia in population by 2050 and reach nearly 1 billion by 2100. In Nigeria, the reasons for such growth are many: a drop in both adult and infant mortality rates due to medical advancements, a growing economy, and a still fledgling use of contraception, among other factors. This is a typical pattern among countries in a similar situation, both past and present. The United States, meanwhile, has grown to over 320 million in 2015. The first national census in 1790 recorded a population just shy of 4 million, with a growth rate of 3% per annum. This rate has gradually declined to around 1% today. One year, however, stands out from the others – 2000. The dot-com boom had reached its peak after 1999, as growth in the internet sector fueled the economy before eventually bursting. Whilst this would have encouraged a higher birthrate, just as economic gains in developing countries have done, this was actually not the case. The net increase in population appears to have had its unique origin not in the country’s birth rate, but in immigration. 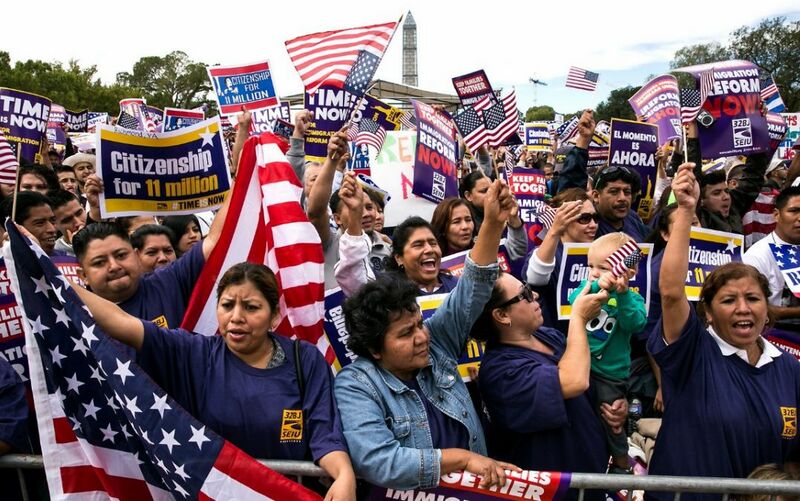 The year 2000 saw 28.4 million immigrants living in the United States, the largest number that had ever been recorded. In 1990, it was below 20 million. Today, it stands at over 40 million. These figures exclude undocumented immigrants, meaning population numbers are even higher in reality. Why did this rate spike so suddenly in 2000, and what drives over a million immigrants to enter the United States every year? The dot-com boom of the 1990s undoubtedly made the United States an attractive destination for immigration. Economic opportunity appeared to be abundant, and demand for labor increased even despite the American birth rate barely being self-sustaining; that is, falling short of the required rate of 2 children per couple. Neighboring Mexico supplies a large portion of the population of immigrants, largely due to the ease of movement across their shared border as opposed to having to travel overseas. Overall, 58 percent of immigrants to the US come from Latin America. This concept is commonly portrayed as a simple case of influx of labor into the job market, but this is not necessarily the case. In examining the reasons for this immigration wave and the momentum thereafter, it can be useful to ask a question about the behavior of another population: American emigrants. Over 800,000 Americans are legal residents in the EU, which is only a few thousand more than the oddly large American resident population in Mexico. Canada, the Philippines, Israel, Japan, and Brazil are among others with resident American populations in the tens of thousands and beyond. Some of the most commonly cited reasons behind this emigration are business opportunities (oil in Dubai), cheaper economies (housing in Mexico), political atmospheres (freedoms in the Netherlands), religious reasons (Jewish diaspora to Israel), or access to government services (healthcare in Canada). These reasons change throughout history, such as political emigrants leaving for Canada after the election of George W. Bush, which spiked minutely after the 2004 election, or the thousands who emigrated from the Confederate States of America to Brazil following the end of the Civil War in the 1860s. Even between 1999 and 2010, the economy had changed enough to cause a wave of emigration in search of better conditions. All of this paints a picture of human migration in general – it happens for a variety of reasons, and tends to happen in waves following particularly significant events. The increase in Mexican immigrants in the United States, starting in 2000, can be attributed to people with low economic status seeking a better job market, access to better education and healthcare, a more politically and socially stable atmosphere, and an overall increase in quality of life. Other immigrant groups may have spiked in different years, including Europeans after the fall of the Soviet Union, and Middle Eastern immigrants – both Muslim and Christian – seeking political and religious freedom in light of regional turmoil that continues today. Many countries around the world have seen similar waves of migration, including the influx of Jewish people into Israel following the 1940s, waves of European migration to such South American countries as Argentina, Chile, and Uruguay in the 1800s, and the sudden departure of white South Africans following dramatic political shifts in 1990 marking the end of Apartheid. In the end, these sorts of population spikes can always be attributed to a catalyst. That catalyst, however, is often difficult to identify in the modern day, as global society is perhaps more dynamic than ever. Such analysis tends to be easier looking back over several decades, as patterns in history become clearer, and yet the details more obscure. The most important lesson from examining spikes in population growth such as that in the United States in 2000 is that the reasons for any change in our global society are exceedingly complex. Human movement across boundaries is as old as the species itself, and will continue to be driven by new factors. The rate of Mexican immigration to the US is falling, while the number of Americans living abroad is increasing. This is a microcosm of the world at large, where the cultures, economies, and political institutions are becoming interwoven, spurring both change and conflict. Worldwide, death rates will fall, longevity will rise, birth rates will increase, and net population will grow and grow. As seen in the United States, a minor challenge such as immigration policy can be over-emphasized and seen as a cause for division. However, the major challenge is how political, economic, and social conditions will be transformed, preserved, and expanded in order to meet the needs of a human community that is changing and growing faster than ever before. The idea was to see if the crop would grow in a combination of alien soil and the artificial atmosphere of a space shuttle. The potato would theoretically provide food while also, along with other possible plants, initiating the natural process of cleaning the air from carbon dioxide. This was a small experiment, initiated with the help of middle school students in potato-famous Idaho; its repercussions, however, could emerge decades later in real Martian soil. The potato has evolved to grow on earth only in certain conditions. Like any plant it has its native environment, as well as a range of regions where it has been successfully introduced. Mars may not be Antarctica or the Sahara Desert, but despite having abundant topsoil it still has more extreme variables than anywhere on earth – more solar radiation, a different atmospheric content, and lower atmospheric pressure. The Spuds in Space project was designed to find out whether or not the potato could be grown in Martian soil with human-controlled conditions such as protection from radiation, adjusted pressure, and an artificial atmosphere. With these measures in place, the only remaining question is whether or not Mars’s red soil itself would capable of nourishing a potato just as well as a field outside of Idaho Falls. 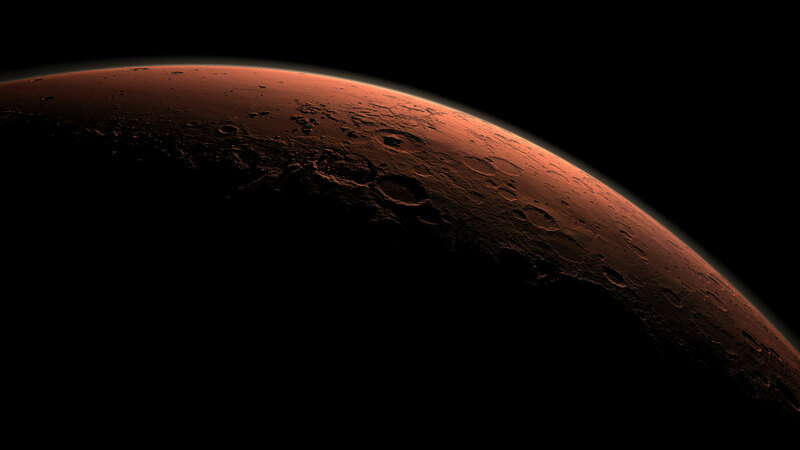 The answer lies in an examination of the makeup of Martian soil. Instruments onboard the Viking lander began collecting information about Martian soil after reaching Mars in the summer of 1976. Over two decades later, the Sojourner lander of the Mars Pathfinder also reached the Martian surface and gathered more up to date readings. 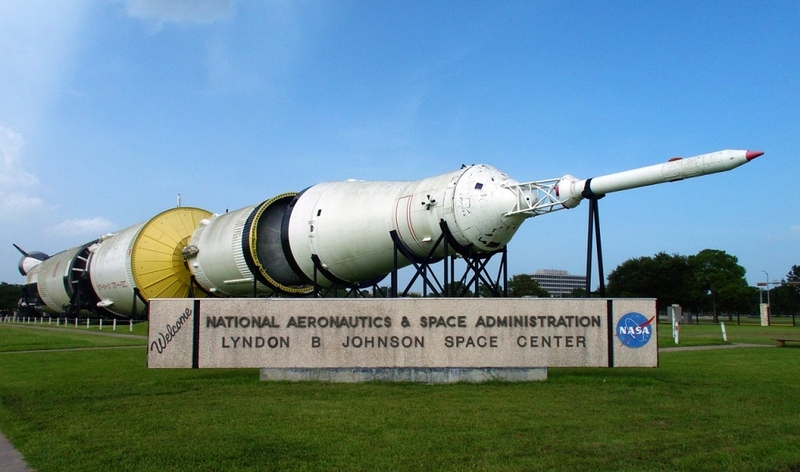 In 1998, researchers at NASA’s Johnson Space Center began to develop JSC Mars-1 soil after determining its properties were very similar to the soil near the famous Hawaiian volcano Mauna Kea. This soil is tephra, a layer of volcanic ash which has been an integral part of agriculture in many regions of the world including Polynesia and Iceland. However, Martian soil can vary greatly in its composition, and it is not all tephra. JSC-1 Mars corresponds very likely to the brightest red areas of the Martian surface. Meanwhile, many other properties of the soil are unknown. Since 2008, it has continued to be tested for nutrients, acidity, and other properties that shape how it may interact with organic compounds and biological organisms. The essential ingredients for life appear to be a combination of these organic compounds – that is, chemical compounds containing carbon with both water and heat. While the surface of Mars is known to reach up to 20 degrees centigrade, the sort of heat involved in biogenesis is more akin to something found in a volcanic environment. Water, meanwhile, was not known to exist on Mars until very recently when the Curiosity rover confirmed that in some places it was notably abundant in the soil. The low heat on Mars suggests that life may not form on a whim, but what if it were indeed introduced in the form of an already existing Earthly seed? Indeed, there is a possibility that the potato, among other plants, could be grown on Mars if the conditions are compatible. Atmospheric pressure would have to be controlled much like the pressure in the cabin of an airliner, most likely using a greenhouse-like structure. Plants grow poorly in low pressure areas like that on Mars, even if they are given an earth-like atmospheric content and are protected from high levels of radiation. Providing additional water, whilst difficult, would be made much more convenient if it becomes possible to collect it at volume on Mars itself. The solution to the potato question, then, lies in engineered adaptation. Explorers to the Americas found that, just like in modern experiments with Martian soil, many of their crops did not comply well with the new environment despite having rich soil. Failure to predict which crops would thrive brought the risk of starvation, but also forced adaptation on the part of humans. Luckily, many were able to experiment with local crops as well as new forms of agriculture often learned from natives. With Mars, modern technology presents the novel approach of modifying plants on a genetic level to adjust to lower pressures rather than undergoing trial and error like in the past. 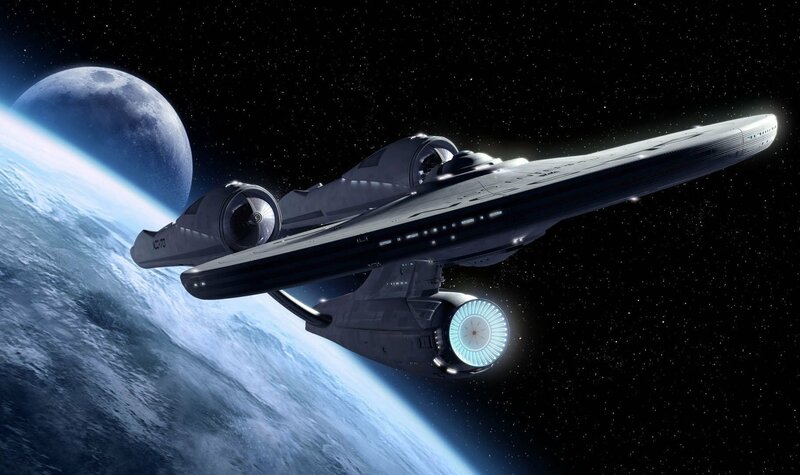 This could serve to eliminate the need for excessive water use and may even pave the way for further modifications involving the types of atmospheric gases a plant can tolerate and the amount of radiation it can withstand – although that is pure speculation at this point in time. Viking settlers in Iceland triggered a process of ecological changes that lasted until the 20th Century, leaving much of the island’s surface as barren as Mars itself. After NASA’s own Viking landers reached Mars, we have begun a new era of exploration that, this time, comes with a degree of ecological caution as we consider not only the romance of human presence on Mars but the sustainability of such an endeavour. To survive without costly and life-or-death dependency on our home, a human settlement on Mars would most certainly need to develop self-sufficiency in the long term. 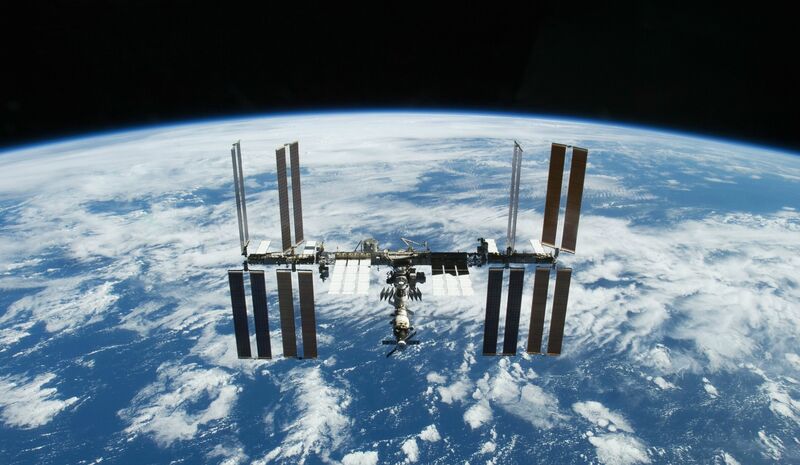 Fundamentally, the great promise of the Spuds in Space concept and the research that has come in the nearly two decades following is that humanity is taking careful steps to understand the importance and opportunity of agriculture beyond our planet. 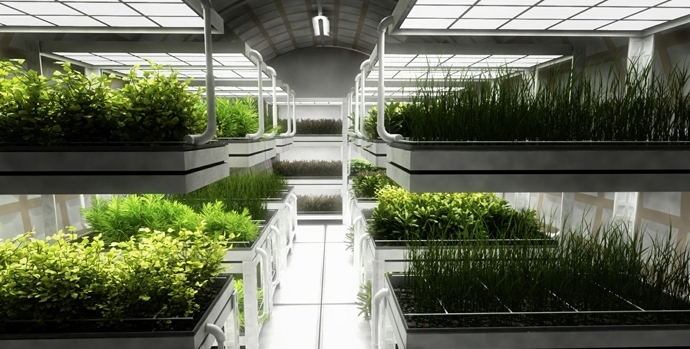 Experiments with JSC-1 Mars soil have found that potatoes, among other edible plants, can indeed be grown if the environment is controlled. There may be no life to be found on Mars just yet, but it appears to be only a matter of time before we set foot onto its surface and, quite literally, seek to take root in a new, red earth.